Dienia montana was previously known as Malaxis latifolius. The vernacular name of “Common Snout Orchid” is most unfortunate for this seemingly attractive terrestrial orchid. I cannot see the reason for this name? They tend to grow in small colonies in shaded, damp areas with a good covering of leaf mulch as you can see in the first photo. 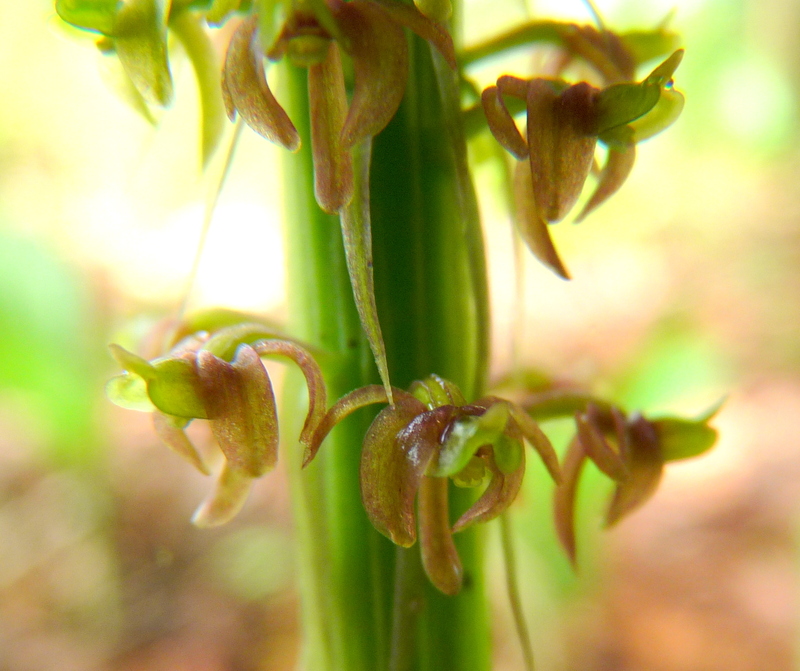 With the recent rains of the last four weeks several terrestrial orchids have started to burst forth. They don’t muck about either. This patch of about 20 plants have only had leaf material showing for about three weeks and already the lower flowers on the flower spikes have blooms that are fully open. The flowers are crowded on a vertical spike ripening from the bottom towards the top. The flowers are a mere 4-6 mm across, making it very difficult to enjoy the true shape and colour. They are also a bit of a challenge to photograph as the plants seem to like living in low light situations. We have quite large clumps of these orchids in gullies coming off the hillsides that have re-vegetated themselves over the last 20 years. 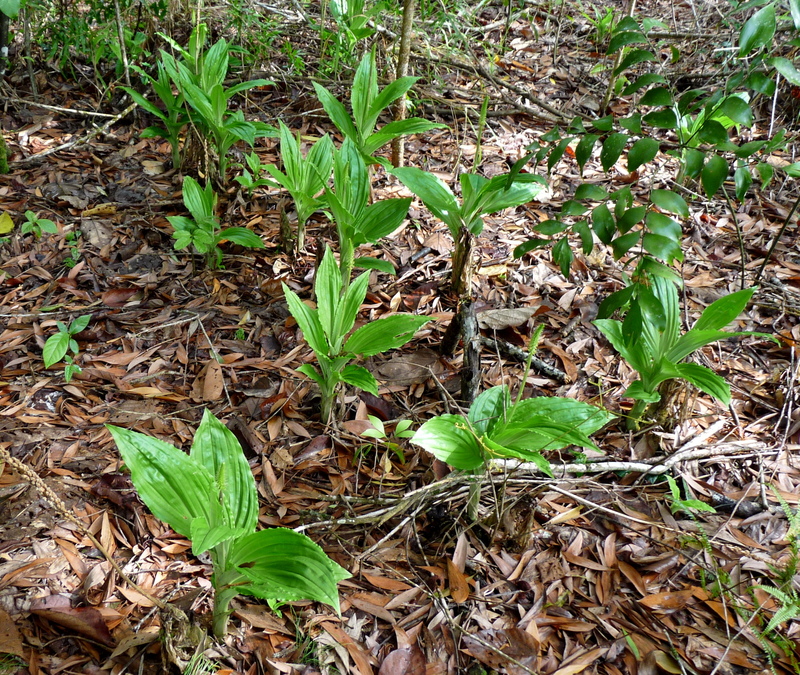 Gradually, as the trees have advanced down the slope, so have several species of terrestrial orchid. The flowers turn from a lime green to a purplish brown as they mature. Unfortunately, like many terrestrial orchids the plants are very seasonal and dry off and shrivel towards the end of the wet season. On another note some months ago I posted the flowering Sarcochilus minutiflos which also has a very small flower. Yesterday while mowing I came across a plant that had fallen out of its tree. The flowers had obviously been fertilised and the pods were fully developed. I was quite surprised by the size of the pods. They were about 6-7 cm long and about 4 mm wide. Quite a contrast to the flowers that produced them that were only 6-8 mm across. 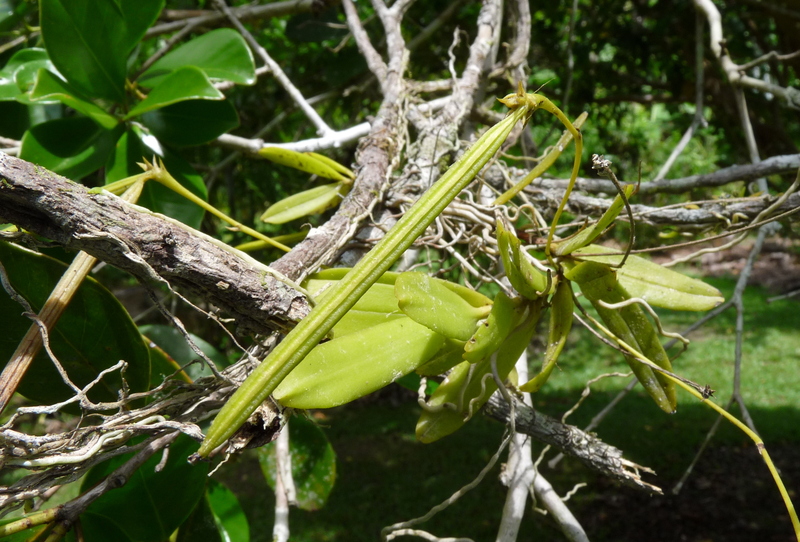 This entry was posted in Daintree Plants and tagged Orchids. Bookmark the permalink. The flowers do look (to me) like that have droopy ears and a pointy snout but maybe I just have a wild imagination. Extraordinary seed pod on the tiny Sarcochilus. I have seen seed pods on S. falcatus, but they are good sized, but the flower is relatively large compared to yours. Good that your Snout Orchids are walking down the hill, slowly expanding their territory.